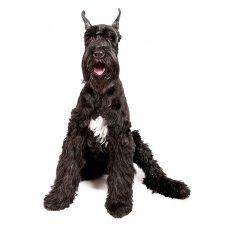 The Giant Schnauzer was developed in the 17th century in southern Germany as a cattle herder. He was known as the Munchener Dog at one time, due to the area near Munich. It is the largest of the three breeds of Schnauzers, the other two being the Standard Schnauzer and the Miniature Schnauzer. Some breeds used in its development were the Great Dane, the Bouvier des Flanders and the Standard Schnauzer. The Giant Schnauzer was originally bred to drive livestock to the market and guard the farmer’s property. They eventually moved into the city, where they became guard dogs for shops and breweries. During both World Wars, the Giant gave valiant service as a police and war dog, suffering so many casualties that many thought the breed was lost. The Giant Schnauzer is intelligent, loyal, brave and usually quiet. They are a versatile working dog, easily trained, and deeply loyal to their families. They need lots of exercise to remain calm. They are easy to train, responding best to firm, calm and consistent training. Giant Schnauzers have been described as trustworthy with children. They make an excellent pet as long as their owner is firm, and they are properly trained and well exercised. Giant Schnauzers usually weigh between 70 to 77 pounds and stand approximately 23 to 28 inches tall. They have a solid, muscular build. Their coat is of moderate length, and it ranges in color from black to salt and pepper. Giant Schnauzers have performed as police dogs. They also train for obedience, agility, herding, and search and rescue.